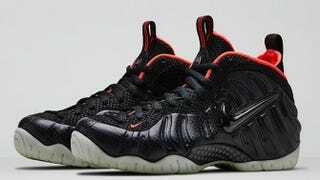 A New York teen wanted a pair of Nike Air Foamposite Pro "Yeezy" sneakers so bad that he was willing to cut the long line that had gathered the night before in front of a Brooklyn Foot Locker. An argument ensued and instead of getting the coveted sneakers, the 15-year-old Brooklyn boy got shot in the foot. Friends identified the victim as Isaiah Martinez and told the Daily News that the normally mild-mannered teen cut the line around 6 a.m. Saturday and then mouthed off to those who told him to move to the back. "There were people camped out for the sneakers and Isaiah tried to cut the line," Martinez's friend Edison Cartagena, 21, told the newspaper. "They get into a scuffle and one of the guys on line left and told Isaiah he was coming back with a gun," Cartagena told the Daily News. "He came back and just fired off four shots." People had lined up early for a chance to purchase the black-and-pink sneakers with the glow-in-the-dark soles for $250. The tennis shoes are inspired by rapper Kanye West and were set to be sold when the Foot Locker opened at 8 a.m.
After the shooting, the teen was taken to a local hospital with an injury reported to be nonlife-threatening. Police were still looking for the shooter. Workers at the Foot Locker wouldn't comment on the shooting.